Journal of Postgraduate Gynecology & Obstetrics: Ovarian Stimulation And Preeclampsia- Dual Causality Association with Subcapsular Hematoma? Ovarian Stimulation And Preeclampsia- Dual Causality Association with Subcapsular Hematoma? Bharti S*, Malani K*, Yadav K*, Samant P**. Subcapsular liver hematoma associated with severe preeclampsia is extremely rare but potentially life threatening complication of pregnancy. It is almost exclusively associated with severe preeclampsia or with HELLP (hemolysis, elevated liver enzymes, and low platelet count) syndrome. We present a case of subcapsular liver hematoma with severe preeclampsia in a 28 year old multigravida with bad obstetric history who had an in-vitro fertilization (IVF) conception. We support the hypothesis that there might be a link between ovarian hyperstimulation and liver dysfunction. Subcapsular hematoma of liver has been reported in less than 2 % of pregnancies complicated by severe preeclampsia and HELLP syndrome but is associated with significant maternal and perinatal morbidity and mortality. It may present as right upper quadrant, epigastric or shoulder pain, abdominal distention, nausea and vomiting. It can lead to life threatening complications such as disseminated intravascular coagulation, acute liver failure, acute renal failure and hemorrhage due to hepatic rupture. Conservative management of subcapsular hematoma is safe in hemodynamically stable patient. In case of rupture of the Glisson’s capsule surgical intervention may be required. It is also proposed that vascular compromise of liver parenchyma caused by ovarian stimulation numerous times may be compounded by HELLP syndrome and may result in subcapsular hematoma of the liver. A 28 year old multigravida with past history of two ectopic conceptions and one abortion, with 28 weeks IVF conception was referred from a peripheral hospital with severe preeclampsia and complaints of right hypochondriac pain for 2 days. She had conceived in her first assisted conception cycle. Cycle had been stimulated with HMG, and a single embryo was transferred. Her ultrasonography (USG) done in private hospital showed a subdiaphragmatic hematoma in addition to a singleton live pregnancy of 28 weeks and 2 days. She had been detected to have hypertension 5 days earlier and was started on tablet labetalol 100 mg thrice a day. On admission, she was pale, and had bilateral pedal edema. Respiratory and cardiovascular examination was unremarkable. Her B.P was 150/94 mm of Hg with 2+ grade of proteinuria. Hemoglobin was 7.3 g/dl, white blood cell count was 13,400/cmm, Platelets were1.44 Lac/cmm and INR was 1.1. Liver function was deranged. Serum total bilirubin was 2.1 mg/dl, SGOT was 356.78 IU/l and SGPT was 652.14 IU/l. Coagulation profile was normal, viral markers were negative. USG done in our institute was suggestive of increasing size of the right sub diaphragmatic collection from 250 cc to 450 cc. MRI (magnetic resonance imaging) was done. It was suggestive of a large unruptured subcapsular hematoma of 6.5x6x5.5 cm in size. Figure 1. MRI image of subcapsular hematoma shown by Black arrows. Pre-induction ripening of cervix was done by Foley’s catheter. Due to inadequate ripening, vaginal Misoprostol was used for induction. Injection MgSO4 was started by Zuspan regimen in view of bilateral deep tendon reflexes being brisk. She delivered a male baby of 920 grams vaginally with APGAR score of 4/10 at 5 minutes. Postpartum USG was done to quantify the volume of hematoma which was 650 cc. Liver function tests (LFT’s) done on postpartum day 3 showed marginal improvement with SGOT 538 IU/l, SGPT 634 IU/l, and INR 0.96. On day 4 postpartum, her SGOT was 131 IU/l and SGPT was 325 IU/l. Subcapsular hematoma was managed conservatively. Serial USG on postpartum day 8 was suggestive of decrease in size of hematoma from 650 to 400 cc and at the end of 3 weeks postpartum organized hematoma with septae was noted. She was discharged in a stable condition on antihypertensive medication. Baby expired on day 10 of life due to intraventricular hemorrhage with severe perinatal asphyxia. She was advised to consider adoption, as spontaneous conception was not possible due to previous bilateral salpingectomy. Subcapsular liver hematoma is accumulation of blood between the capsule of Glisson and the liver parenchyma. It was first described in association with pregnancy by Abercombie in 1844. Rosen and colleagues have quoted a speculation that the initial event in the pathogenesis of subcapsular hematoma is fibrin deposition in the liver sinusoids that is followed by thrombosis, and hepatic hemorrhage that then dissects through the capsule. Histopathological examination of the livers’ with subcapsular hematomas have shown hemorrhage and necrosis in hepatic parenchyma, periportal necrosis and microaneurysms. Subcapsular liver hematoma is mostly associated with preeclampsia/ eclampsia and HELLP syndrome, presenting in second or third trimester with 30 % occurring postpartum within 48 hours of delivery. Some case reports and reviews exist in which upto 14 % patients with liver hematoma had no clear diagnosis of preeclampsia or HELLP syndrome. In the investigations, severe anemia, markedly elevated transaminase enzymes, thrombocytopenia, and abnormal coagulation profiles are noted. The hematoma can be diagnosed by USG, CT scan, and/or MRI. It requires prompt delivery. 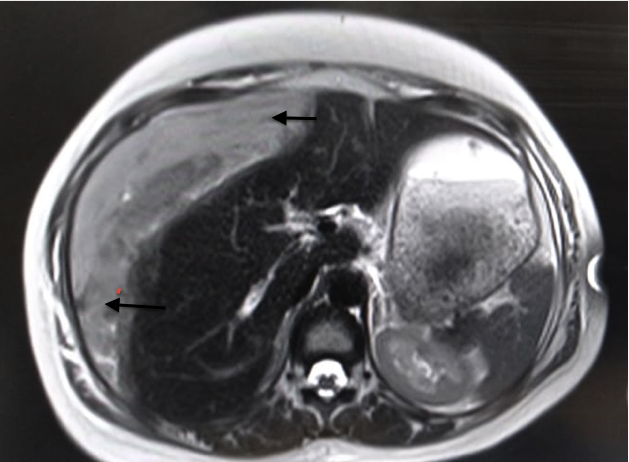 Giugliano and colleagues have described a case of near fatal liver dysfunction with ruptured liver hematoma in an IVF pregnancy complicated by hypertension. They propose that multiple cycles of controlled ovarian stimulation or resultant hyperstimulation in IVF pregnancy may cause silent liver dysfunction due to inflammatory mediators and it may be worsened by HELLP syndrome due to preeclampsia. Different mediators like renin-angiotensin or interleukin 6 are found to increase in ovarian hyperstimulated cycles. These mediators are likely to cause microvascular thrombosis leading to liver parenchymal ischemia and thus adversely affecting liver function. Hepatic injury due to HELLP may be due to endothelial dysfunction. All these together can cause the patient to present with DIC, hypervolemia, liver ischemia, and subcapsular hematoma. In a large retrospective cohort study of 1,357 pregnancies conceived by assisted reproductive technology, preeclampsia has been found to be more common. The index pregnancy was the first IVF conception of our patient. She presented with signs and symptoms of preeclampsia, markedly elevated serum aminotransferase, raised bilirubin, and low hemoglobin. MRI confirmed the diagnosis of a large subcapsular hematoma of the liver. Though we could not establish occurrence of ovarian hyperstimulation in the early pregnancy in our case; it is an interesting hypothesis for occurrence of subcapsular hematoma at a later gestation with preeclampsia. The incidence of recurrent hepatic capsular rupture is quoted to be less than 2%. Management in hemodynamically stable patient is essentially conservative and includes intensive fluid replacement, blood and fresh frozen plasma transfusion, monitoring of liver function test, serial scan of hematoma by USG or CT scan until resolution of liver hematoma. Decision to terminate pregnancy vaginally should be considered and cesarean delivery should be reserved for obstetric indications only. Hemodynamic instability requires exploration. Bleeding surfaces are packed with collagen sponges and perihepatic space is drained. In some cases, percutaneous hepatic artery embolization could be an alternative procedure for control of hemorrhage. Liver transplantation may be needed in cases of acute liver failure. In our patient, hemodynamic status was not compromised. We followed non-invasive conservative management. Since high estrogen is a potential cause for liver dysfunction, non hormonal contraception would probably be the safest advise for such patients. Early diagnosis and intervention decreases morbidity and mortality in a case of severe pre-eclampsia with subcapsular hepatic hematoma and deranged liver function tests. More studies are required to explore the possible synergistic link between multiple consecutive ovarian stimulation cycles and HELLP syndrome in preeclampsia affecting liver histology and function. Manas KJ, Welsh JD, Rankin RA, Miller DD. Hepatic hemorrhage without rupture in preeclampsia. New England Journal of Medicine1985;312(7):424–426. Karateke A, Silfeler D, Karateke F, Kurt R, Guler A, and Kartal I. “HELLP Syndrome Complicated by Subcapsular Hematoma of Liver: A Case Report and Review of the Literature,” Case Reports in Obstetrics and Gynecology. 2014;Article ID 585672: 3 pages. Rosen SA, Merchant SH, VanderJagt TJ, Crookston KP. Spontaneous Subcapsular Liver Hematoma Associated With Pregnancy. Archives of Pathology & Laboratory Medicine.2003;127(12):1639-1640. Schwartz ML, Lien JM. Spontaneous liver hematoma in pregnancy not clearly associated with preeclampsia: a case presentation and literature review. Am J Obstet Gynecol. 1997;176(6):1328-32. Borgaonkar MR, Marshall JK. Marked elevation of serum transaminases may be associated with ovarian hyperstimulation syndrome. Am J Gastroenterol. 1999;94(11):3373. Araujo AC, Leao MD, Nobrega MH, Bezerra PF, Pereira FV, Dantas EM, et al. Characteristics and treatment of hepatic rupture caused by HELLP syndrome. Am J Obstet Gynecol. 2006;195(1):129–133. Chen XK, Wen SW, Bottomley J, Smith GN, Leader A, Walker MC. In vitro fertilization is associated with an increased risk for preeclampsia. Hypertens Pregnancy 2009;28(1):1-12. Han GH, Kim MA. Recurrent spontaneous hepatic rupture in pregnancy: A case report. Medicine (Baltimore). 2018;97(29):e11458.